After spending the past six seasons in Major League Baseball, outfielder Nori Aoki is reportedly headed back to Japan. Both the Kyodo News and Japan Times report that the 36-year-old Aoki has agreed to a three-year contract with the Yakult Swallows of Japan’s Nippon Professional Baseball. The CAA client’s deal is reported to be worth one billion Yen — or $9.19MM in total over that three-year term. Aoki split the 2017 season between the Astros, Blue Jays and Mets, hitting a combined .277/.335/.393 with five homers and 10 steals over the course of 374 plate appearances. That marked the lowest total of plate appearances he’d received in a season since coming over from NPB with the Brewers in 2012, though his overall output at the plate was still only slightly below the league average in the estimation of metrics like OPS+ (98) and wRC+ (97). That said, Aoki was one of many options for MLB teams on a crowded free-agent market for outfielders (MLBTR Free Agent Tracker link), and heading into his age-36 campaign, he was also one of the older players on that market. As the game increasingly gravitates away from guaranteeing significant commitments to players in their late 30s, it seems likely that Aoki would’ve had to settle for a minor league pact or a low-salary, one-year commitment from a big league team if he wished to continue playing in North America. Instead, he’ll head back to the organization where he starred from from 2005-11 prior to making the move to Major League Baseball. In parts of eight seasons with Yakult, Aoki posted a hefty .329/.402/.454 batting line with 84 homers and 164 stolen bases. He’ll return as a well-traveled elder statesman on the tail end of his career, hoping to benefit the team both on the field as well as off the field as he shares his experiences with the organization’s younger talent. Given that the reported contract will run through Aoki’s age-38 season, it seems quite likely that his days in the Majors could be over. If that indeed proves to be the case, then he more than held his own in the big leagues. The remarkably consistent Aoki hit between .277 and .288 in each of his six seasons here, and his on-base percentage never dipped below this past season’s mark of .335. In all, he batted .285/.350/.387 as a Major Leaguer, spending time with the Brewers, Royals (with whom he appeared in the 2014 World Series), Giants, Mariners, Astros, Blue Jays and Mets. In his latest column for The Athletic, Ken Rosenthal chats with five players — Max Scherzer, Daniel Murphy, Paul Goldschmidt, Jerry Blevins and Chris Iannetta — about their concerns over the proposed 20-second pitch clock and their more general thoughts on the league’s pace of play initiatives. All of the players express a willingness to change and acknowledge that they’re in favor of speeding up the game to an extent, though none voiced support of a clock. Iannetta states that the clock “fundamentally changes the way the game is played,” while Goldschmidt shares some concerns he’s heard from Double-A and Triple-A players that have played with the clock but found it to be a headache. “In some cases, I heard of ways around the rule,” says Goldschmidt. “You could kind of gimmick it. You could slow down the game. You could step off. It wasn’t like it just forced guys to throw pitches a lot quicker. There was a lot of gray area guys weren’t comfortable with.” Both Scherzer and Blevins, meanwhile, expressed some frustration with the fact that they’re routinely on the mound ready to go but have to wait an additional 20-30 seconds for commercial breaks to end. It’s an interesting read for those who have strong feelings, one way or another, on the newest slate of proposed rule changes to the game. It’s prospect ranking season! Baseball America rolled out their 2018 Top 100 list today, headlined by Braves outfielder Ronald Acuna in the top spot. Of course, the decision was far from easy for them, and the BA staff explained the decision process at length in a separate post for BA subscribers. As JJ Cooper, Ben Badler, Kyle Glaser, Josh Norris and Matt Eddy explain in great detail, there were feelings among the BA staff that any of Acuna, Shohei Ohtani or Vladimir Guerrero Jr. could have been the No. 1 overall prospect this season. Among the factors considered when trying to reach a consensus were the age-old position player vs. pitcher debate as well as Acuna’s proximity to the Majors relative to Guerrero. Meanwhile, over at ESPN, Keith Law published the first half of his Top 100 prospects today. There are several notable players that have been traded in the past year on the back half of the list, including Sandy Alcantara (whom the Marlins received as the headliner in the Marcell Ozuna swap), James Kaprielian (who went to the Athletics as part of last July’s Sonny Gray trade) and Franklin Perez and Daz Cameron (who went to the Tigers in the Justin Verlander blockbuster). Angels fans will be heartened to see four entrants on the list — Jahmai Jones, Chris Rodriguez, Brandon Marsh and Jo Adell — as their once lowly farm system begins to build back up. Dan Connolly of BaltimoreBaseball.com looks at the Orioles’ need for a left-handed-hitting outfielder to balance out the lineup and runs down a list of players that have “intrigued various members of the organization.” That includes Carlos Gonzalez, Melky Cabrera and Nori Aoki, according to Connolly, in addition to other names that have been recently mentioned (e.g. Jarrod Dyson). Trey Mancini and Adam Jones figure to be in the outfield regularly, but the Orioles’ hope is that they can acquire a defensively superior option to Mark Trumbo to slot into right field, thus pushing Trumbo to DH. In a fantastic column for the Players’ Tribune, Andrew McCutchen bids an emotional farewell to the city of Pittsburgh, which he writes “will always be home” and “will always mean everything” to him. McCutchen recounts the overwhelming experience of the standing ovation he received at the Pirates’ final home game of the season last year, as Bucs fans recognized that they may never see him in a Pirates uniform again. He also shares his experience of finding out about the trade, with credit to Neal Huntington for how he handled the process. Fans of the Pirates, Giants and baseball in general will all want to check out the column in its entirety. The Mets have released veteran outfielder Nori Aoki, per a club announcement. He had been eligible for arbitration, but will instead return to the open market in search of his next destination. Aoki, 35, caught on with the Mets after opening the 2017 season with the Astros and joining the Blue Jays via trade. In total, he compiled 258 plate appearances of .277/.335/.393 hitting on the season. That rates right near the league average in total output, which is more or less where Aoki has landed in all of his six MLB campaigns. The move isn’t at all surprising given Aoki’s projected arbitration salary, which sat at a fairly hefty $6.3MM. Still, he’ll surely draw interest in free agency. For all he lacks in upside, Aoki has been stunningly consistent since coming over from Japan. Despite little power, Aoki is nearly impossible to strike out. And while his output against lefties dipped this year in a small sample, he has generally shown little in the way of a platoon split. The Mets have signed veteran outfielder Nori Aoki, MLB.com’s Anthony DiComo tweets. The Blue Jays released Aoki earlier this week, making him eligible to sign with any team for a prorated portion of the league minimum salary. 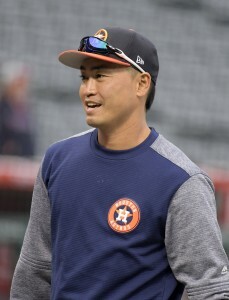 The 35-year-old Aoki has produced a respectable .274/.319/.402 line over 258 plate appearances with the Astros and Jays this season, but has now changed teams twice, first heading from Houston to Toronto in the Francisco Liriano deal (likely in part to balance salaries in that trade) and now going from Toronto to New York. He has little power, with just five home runs this season, but he retains some of his established ability to make contact and still rates as approximately an average defender in a corner. Aoki will aid a Mets team that’s short in the outfield following the departures of Jay Bruce and Curtis Granderson last month, as well as significant injuries to Yoenis Cespedes and Michael Conforto. Aoki is eligible for salary arbitration in the offseason, but he would likely be in line to receive a salary above the $5.5MM he’s getting this season, so he appears to be a non-tender candidate. Aug. 29: The Blue Jays announced that they’ve given Aoki his unconditional release. He’s a free agent and can sign with any team for the pro-rated league minimum through season’s end. Aug. 28: The Blue Jays have designated outfielder Nori Aoki for assignment and recalled right-hander Leonel Campos from Triple-A Buffalo to clear a spot on the active roster, tweets Shi Davidi of Sportsnet. 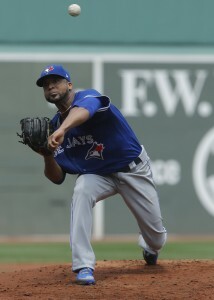 Toronto acquired Aoki, 35, at the non-waiver trade deadline in that swap that sent lefty Francisco Liriano to the Astros. Aoki’s inclusion in the deal, however, looked to be largely a financial mechanism to provide further incentive for Houston to part with well-regarded outfield prospect Teoscar Hernandez. That looks to be even more true now, as Aoki logged just 34 plate appearances with the Jays and hit .281/.294/.594 with a double and three homers in that time. Even with that small power surge, Aoki’s batting line on the whole is a rather pedestrian .274/.319/.402 in 258 PAs between Houston and Toronto. He’s earning $5.5MM in 2017, and about $1.02MM of that sum is yet to be paid out. The Jays can spend the next week looking for a trade partner or can simply eat the remainder of the contract and release Aoki into free agency. He’s arbitration-eligible through the 2018 campaign, though given his lackluster offensive output and fairly sizable $5.5MM salary, he was a non-tender candidate for the Jays this winter anyhow. The Astros have added lefty Francisco Liriano from the Blue Jays in exchange for veteran outfielder Nori Aoki and younger outfielder Teoscar Hernandez. Houston is said to view Liriano as a reliever for the remainder of the season. While the 33-year-old Liriano has had a poor season in the Toronto rotation, he’s maintained his velocity and his effectiveness against left-handed opponents. That’s led to plenty of speculation, both here and elsewhere, that the veteran southpaw could emerge as a possible bullpen option for teams unwilling to meet the asking prices on the market’s top relievers. Through 63 plate appearances this season, left-handed opponents are batting just .230/.254/.361 against Liriano. The lefty has a 17-to-1 K/BB ratio in those matchups and has averaged nearly 93 mph on his fastball this season. One would imagine that in moving to a short relief role, that velocity could tick upward a couple of notches. Liriano is a free agent at season’s end and is earning $13MM in the final campaign of a three-year, $39MM contract. He’s still owed about $4.48MM of that sum. Aoki, 35, is earning $5.5MM in 2017 and is owed $1.89MM of that sum through the end of the year. It’s not clear if there’s additional cash in the deal, but as it stands, the Jays will be saving about $2.59MM this this swap. Considering Houston is sending a minor leaguer as well, though, it wouldn’t at all be a surprise for Toronto to pick up some of all of the remaining tab on Liriano. Aoki has batted .272/.323/.371 through 224 plate appearances this season. While he’s under club control through the 2018 campaign via arbitration, his age and lack of offensive output make him a non-tender candidate after the season, as he’d likely be in line for a raise that would send his salary north of $6MM. The 24-year-old Hernandez ranked ninth among Houston farmhands on MLB.com’s midseason top 30 list and is a more or less MLB-ready commodity. He’s hitting .279/.369/.485 with a dozen homers and a dozen steals through 347 Triple-A plate appearances this year. Hernandez hasn’t exactly thrived in a small sample of 113 MLB plate appearances, but he’s held his own with a .230/.304/.420 slash. The Astros likely deemed Hernandez somewhat superfluous, however, with George Springer, Josh Reddick and Derek Fisher all in the Majors, to say nothing of top prospect Kyle Tucker lurking in the upper minors. MLB Network’s Ken Rosenthal reported that the two sides were in talks (via Twitter). USA Today’s Bob Nightengale said the two sides were close to a deal (on Twitter). Shi Davidi of Sportsnet reported the agreement (on Twitter). Brian McTaggart of MLB.com reported that Aoki and a minor leaguer were going to Houston (Twitter link). Sportsnet’s Shi Davidi (on Twitter) had Hernandez’s inclusion. Brian Dozier is drawing interest from other teams but the Twins aren’t looking to tie Phil Hughes’ contract to Dozier in trade talks, Mike Berardino of the St. Paul Pioneer Press tweets. Hughes still has three years and $39.6MM remaining on the extension he signed with the Twins prior to the 2015 season, and since inking that new deal, Hughes has struggled badly and battled injury problems. The veteran righty underwent surgery to help alleviate thoracic outlet syndrome last summer, and Hughes believes he can regain his old form now that he’s healthy. The Mets don’t seem to be looking for a big change at catcher, as Kristie Ackert of the New York Daily News reports that the team told representatives of a free agent catcher that Travis d’Arnaud will be given every opportunity to succeed next season. Since the Mets offered d’Arnaud as part of trade talks for Jonathan Lucroy over the summer, it’s notable that the team is reaffirming its commitment to the talented but oft-injured catcher, though it could be that New York was more enamored with Lucroy than it is with the options on free agent catching market. Ackert does note that the Mets could look for a more reliable backup, given d’Arnaud’s injury history and the shared offensive struggles of Kevin Plawecki and Rene Rivera. Though Nori Aoki has only been an Astro for less than three weeks, the veteran outfielder may now be a non-tender candidate, the Houston Chronicle’s Jake Kaplan writes. If the Astros plan to use the newly-signed Josh Reddick in left field, Aoki will be a very highly-paid fourth outfielder (thanks to a projected $6.8MM arbitration salary) and possibly an expendable part. If the Astros use Reddick in right and move George Springer to center field, Aoki will again have more of a clear role, platooning with Jake Marisnick in left. Houston has also been linked to some first baseman in rumors, which could push Yulieski Gurriel to left field and again leave Aoki without regular playing time. For the second straight offseason, Mariners GM Jerry Dipoto is acting quickly on lower-profile moves to elevate his team’s talent floor, ESPN.com’s David Schoenfield writes. Additions like Danny Valencia, Richie Shaffer and Carlos Ruiz fill holes and add more valuable depth around the Mariners’ core players, the type of top-to-bottom roster management that former Seattle GM Jack Zduriencik was unable to achieve in his time with the club. While several big-name relievers are dominating headlines this winter, MLB.com’s Mike Petriello cites Daniel Hudson, Juan Nicasio and Koji Uehara as relatively inexpensive arms who could provide major dividends in a bullpen next season, perhaps even as closers. 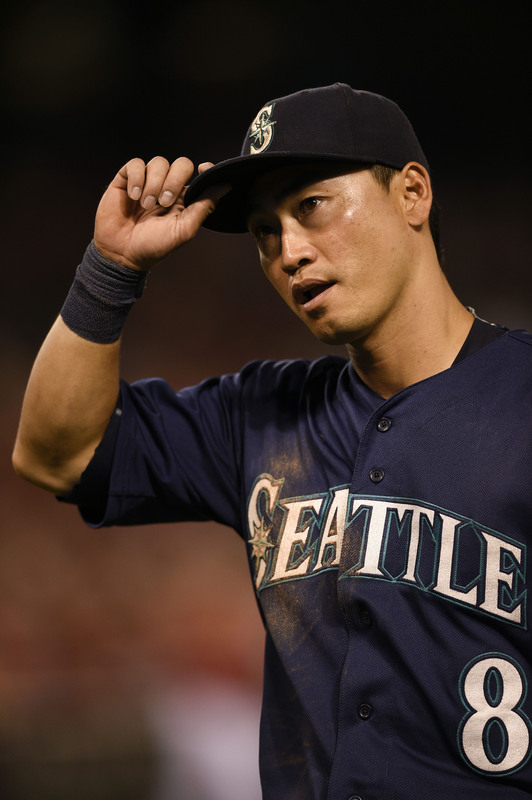 The Astros announced today that they’ve claimed outfielder Nori Aoki off waivers from the Mariners. As MLB.com’s Greg Johns pointed out earlier today (on Twitter), there’s been a public misconception that Aoki is eligible for free agency because his option didn’t vest and because his previous contracts allowed him to hit free agency upon their completion. That doesn’t appear to have been the case with the one-year deal he inked in Seattle last offseason, and he’ll now be controllable by the Astros via arbitration for the 2017 season. Aoki, 35 in January, will give Houston an option to take some at-bats in left field next season in the wake of Colby Rasmus’ impending departure. He’ll bring a contact-oriented approach to the Astros that represents something of a departure from the strikeout-prone bats with which Houston has been comfortable in recent years. Aoki hit .283/.349/.388 in 467 plate appearances and struck out at just a 9.6 percent clip with Seattle last year after signing a one-year deal in the offseason. That contract guaranteed Aoki $5.5MM and came with a vesting option for the 2017 season, but Aoki fell 13 PAs shy of triggering that guaranteed 2017 payday. It would appear that the Mariners sought to outright Aoki, thereby allowing him to re-enter the free agent market, but he’ll now head to Houston as an arbitration eligible player. Presumably, he’s the front-runner for everyday at-bats in left field right now, where he’ll bring a career .286/.353/.387 slash and minuscule eight percent strikeout rate to the table. That’ll position the Astros to deploy an outfield with Aoki in left in budding star George Springer in right field. As it currently stands, defensive standout Jake Marisnick will get the bulk of the at-bats in center field, although the Astros have a number of versatile pieces that could allow them to pursue a variety of avenues this offseason. Springer, for instance, could shift over to center field — especially now that Tal’s Hill has been removed from Minute Maid Park — and allow the Astros to pursue a big-time corner outfield bat. Alternatively, Houston could give Alex Bregman and/or Yulieski Gurriel some time in left field with Aoki covering right field and Springer taking some turns in center, thus freeing up more room for a corner infield/designated hitter addition.